Lens Color black/blue/silver/green/yellow Size Lens Width: 1.81" Lens Height: 1.85" Frame Length: 5.20" Bridge Width: 0.94" Arm Width: 5.08" Package 1x Sunglasses 1x Soft Glasses Cloth 1x Spectacle Glasses Case 1x Screwdriver 1x Exquisite Packaging Carton FEIDU SUNGLASSES Round sunglasses Style and Quality is what we convey to our customers. Classic Vintage design from FEIDU. 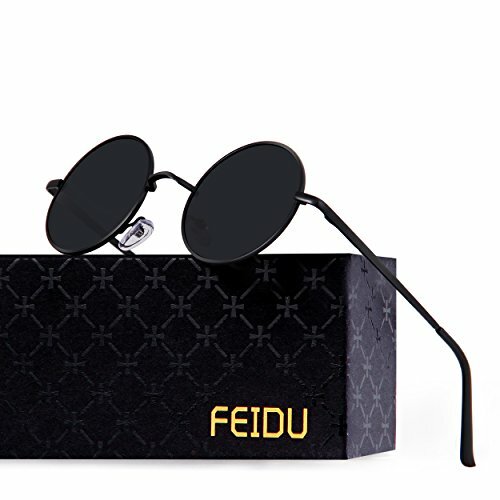 FEIDU FD8003 Polarized metal Sunglasses Features Lightweight and durable Easy to clean Scratch resistant Rubber nose grip resist to keep your glasses in place. 100% UV Protection Filter out 99% of reflected glare without haze or optical distortion. Protect your eyes and enjoy a high clarity vision more comfortably. 2017 fashion design The fashionable metal sunglasses style on 2017 and selling on Amazon .Wear it very fashionable, free to match .It's good accessories sunglasses for men women . Suitable for Outdoor Activities Polarized round sunglasses, men and women alike, whether you're into vocation, travelling, walking, driving, sports and more . Suitable for universal face shape No matter what your face shape , wearing this product will be very fashionable. TAC POLARIZED LENS- 100% UV400 protection coating, blocks 100% harmful UVA & UVB Rays. Purchase from WSUK with confidence that the sunglasses you receive are fully CE certified .Restore true color, eliminate reflected light and scattered light and protect eyes perfectly. ROUND STYLE SUNGLASSES-The round style sunglasses are very fashionable .Through the continuous development to meet today's fashion needs .It is the best choice. FLEXIBLE AND DURABLE GREAT WEARING EXPERIENCE - Our round polarized sunglasses not only have the fashionable style but also have the Humanized Design. Elasticity frame and Silicone nose pad give you different wearing feelings. EXQUISITE PACKAGE-On the package, we put a soft case ,cleaning cloth and small screwdriver with both plain and cross head tips for many adjustments if needed in the future. The screwdriver and polarizing card can also help you know more about the sunglasses. FEIDU GUARANTEE ON AMAZON. 30-Day Money Back Guarantee. 24-hour customer services before purchase and after sales. If you have any issue, please contact us. we are here to help you!